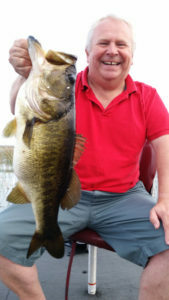 Florida bass fishing on Lake Toho has been fast and furious. Today I had a client that was here in Central Florida on vacation with his family from England. He fished a 4 hour guide trip with us and caught over 15 bass by 9:30 am and probably had close to 30 bites. His name was Allen and he fished by himself so he was one busy bass fisherman. A couple of times he had two bass on at the same time! Before he could get one bass in the net, another was on the other rod. We even caught a black crappie on a shiner! Allen commented that it was one of the best days of his life because the action was so fast it never gave him a chance to get bored. So if you’re here in Central Florida or are planning a trip to the Disney World area why don’t you give us a call here at AJ’s Freelancer Bass Guide Service Inc. and let us guide you to the bass fishing adventure of a lifetime. We know where your next trophy bass lives. I’m looking forward to bass fishing with you all real soon.